How a chance discovery changed a curious New Yorker’s life. I discovered the dance by accident. Five summers ago, I was running along the West Side Highway, looping around Pier 45 near Christopher Street. There I witnessed clusters of couples moving in graceful circles. Like anyone with a modicum of curiosity and poor lung capacity for cardio, I stopped to watch. Looking back, it makes perfect sense that I was intrigued. The artistic outdoors is among my favorite things about the city. Walk outside and who knows what you’ll find—and often, the happenings are free! And if such recreations—theater, film, food—never moved en plein air, I never would have found my most recent obsession: the tango. “What are they doing?” I asked a man as he finished a sandwich from the sidelines. “Argentine tango,” he told me, crumpling his tinfoil. Then he invited me to dance. My new and unexpected dance partner was the organizer of Volvo Tango, the outdoor milonga (or dance event) where enthusiasts gather every Wednesday and Sunday to tango until the sun sets. That first time I danced, I was wearing my running shoes, surrounded by women in heels. No one batted an eye. I returned the next week, then the week after, uncertain but delighted to learn. 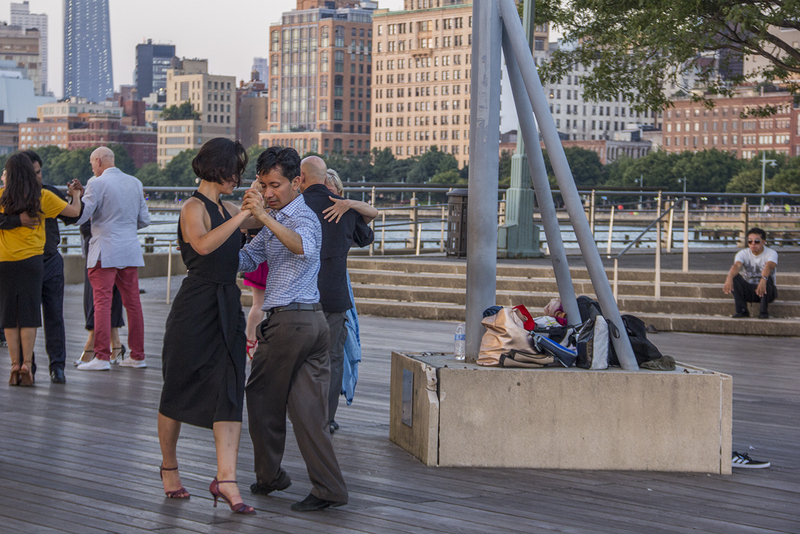 In time I’d discover that New York’s tango scene is robust—visit New York Tango and you’ll find milongas happening around the city almost every evening—and its community of dancers highly diverse. Although New York famously contains multitudes of people, very rarely do they genuinely commingle outside of crowded morning subway cars. At Volvo Tango, it feels as if almost every age, gender, race, and nationality are represented. Over the years I’ve danced with a barefoot acting student from Argentina, a Taiwanese man who lived in San Francisco, and a jewel appraiser from Texas. Each week I see local returnees: the kindly Indian man in a page-boy cap, my Mexican friend who always wears a button-down and slacks, the former New York City Ballet ballerina in her 70s. And then there’s me: the Hawaiian-born writer fumbling in her purple-heel shoes. In most aspects of our lives, my partners and fellow dancers have nothing in common. 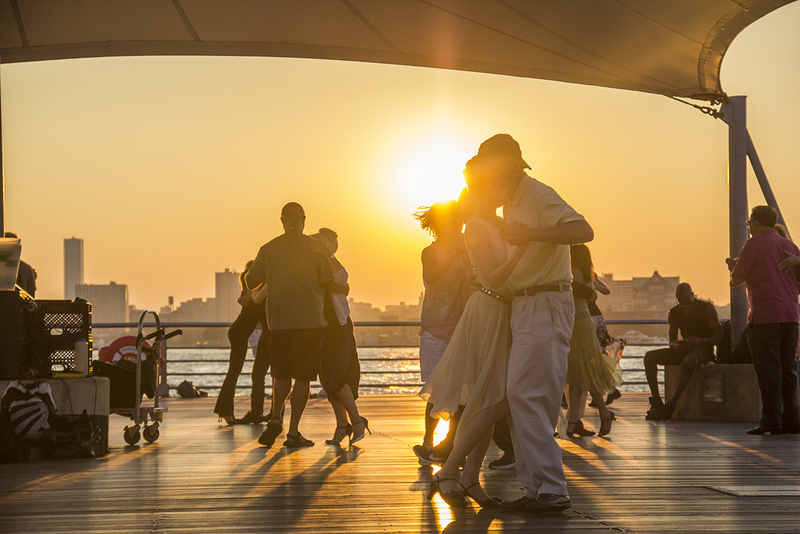 We share only our love of tango. And unlike normal social interactions, we can’t hide behind clever turns of phrase or other social armaments. In dance, we’re exposed; we reveal ourselves through our movements. That’s why I love it. 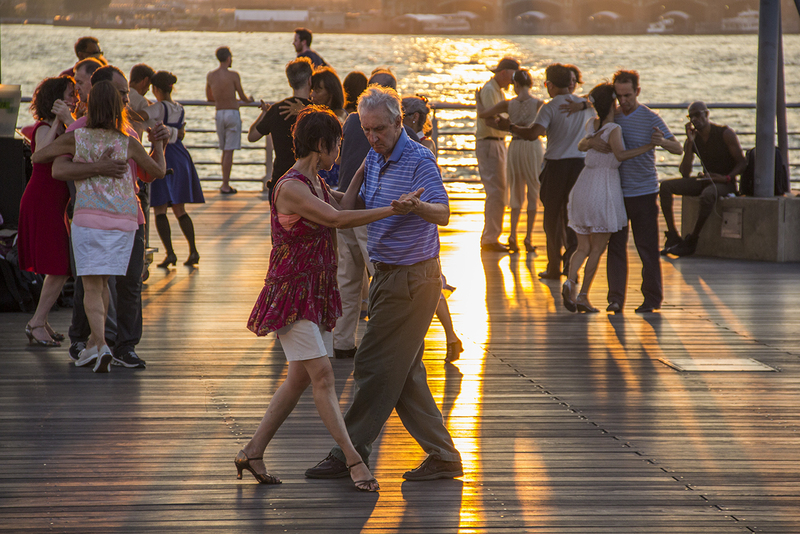 Tango is the most intimate act you can perform in public. It requires relinquishing control, placing total trust in the other person, and attenuating yourself to his or her gestures. The moment you become self-conscious, you lose momentum. In dance, we’re exposed; we reveal ourselves through our movements.Tango is the most intimate act you can perform in public. Tango is both terrifying and freeing, calming and intoxicating. When else can you intimately commune with a total stranger without speaking? Even now, after all these nights of tango, I get nervous. I start to tense, second-guess myself, or try to anticipate my partner’s steps. It never works. In those moments, I’ve learned to close my eyes and surrender, allowing my partner to lead until the city sounds quiet and it’s just the two of us, moving through our own world. Away from the dance floor, I cannot say that I always carry this faith with me. But tango teaches me patience that influences my everyday interactions. Through losing my own careful defenses, I can recognize how we all arm ourselves, concealing our vulnerabilities from view. In small ways, I try to combat this impulse within myself. I seek out ways to subsume myself to something greater. Like letting a cumbersome woolen coat fall to the floor, it produces a feeling of relief. 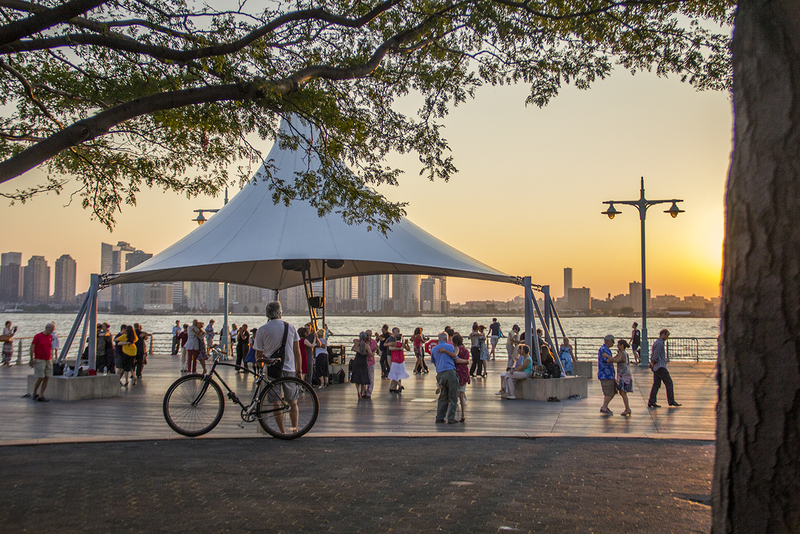 When our dance ends, I open my eyes and absorb all that surrounds me: the glittering water, the gliding ships, the sun crouching behind the New Jersey skyline. I see passersby and tourists, how they pause to admire and observe as I once did. Should you find us, you could gaze from the sidelines as well. But it’s far better to dance. If you slip into this graceful crowd, someone will find you. And, as I learned very well, they will welcome you with open arms. Alexis Cheung is a nonfiction writer from Hawaii living in New York City. Her essays and reporting have appeared in The New York Times, T Magazine, and The Cut, among other publications. Read her Instagram captions @alexischeung.